My mom and I are cut from the same mold and upon hearing that we are fully eligible to adopt, we set out to get a few of the basics checked off the list. We found ourselves at Baby’s 1st Furniture in Sugar Land where she had already done some browsing. Knowing that nursery furniture can take several months to arrive, we started here, thinking that having the big stuff already in place would help in the event of short notice. Tyler and I were in agreement that it would be cruel to completely set up the nursery now only to be constantly reminded of the void in our hearts, but I felt safe and free to dream given the long lead time on the furniture. And so we walked in. I was anxious from my last experience at a baby store and tried my best to be on guard for whatever questions I might have to face. Thankfully we were approached by Barb, the sweetest sales associate and were simply told to ask if we needed any help (thank you, Barb! This is all that is ever necessary in the first encounter with a potential buyer). We took a look around at all of the options and I immediately felt drawn toward a vintage grey finish for the nursery furniture, knowing that it would be gender neutral and versatile. Within a few minutes I focused in on a precious collection that was simple, elegant and traditional. The crib has sweet little curves and the dresser is so neat in that it has a built in section for a changing pad on the top, and yet the entire dresser can be flipped to create a standard top when the time is right. We also purchased a sweet rocking chair where I envision we will spend many late nights. Purchasing these two pieces meant so much. It meant that one day, someday, there will be a sweet little baby in that crib. And that crib and that baby will be in our home, and it will change our lives forever. It meant that I could finally start to see ahead to what is sure to be the answer to many years of prayers, and the start of our family. Approaching the check out counter was a very surreal feeling, this being the first physical expression that we are “expecting.” I explained to Barb that we are adopting and didn’t quite know the timing of everything. I think it was almost my way of justifying why we were there when we have no concrete information at this point. And then something happened that I had never imagined. Barb cut through all of my insecurities with one word – “congratulations.” With this word, offered so genuinely, came a sense of no longer feeling invisible, no longer feeling as though God has forgotten, no longer feeling as though the whole world is rushing past us without looking back. For more than 2 years I have held it perfectly together, all of my emotions wound up in a smile for others to see, always. This was different. I had been recognized by someone who was previously a complete stranger. I was congratulated for being an expectant mom and it was profound. It brought tears to my eyes and right there at that check out counter, I cried. My mom and I shared a big hug and she reminded me that everything I was feeling was ok, and how I have waited so long for what to some could be such a simple outing, a normal next step. My mom knows me too well and we drove nearby for a celebratory latte :). It’s a day and a feeling I will never forget. It’s beautiful! 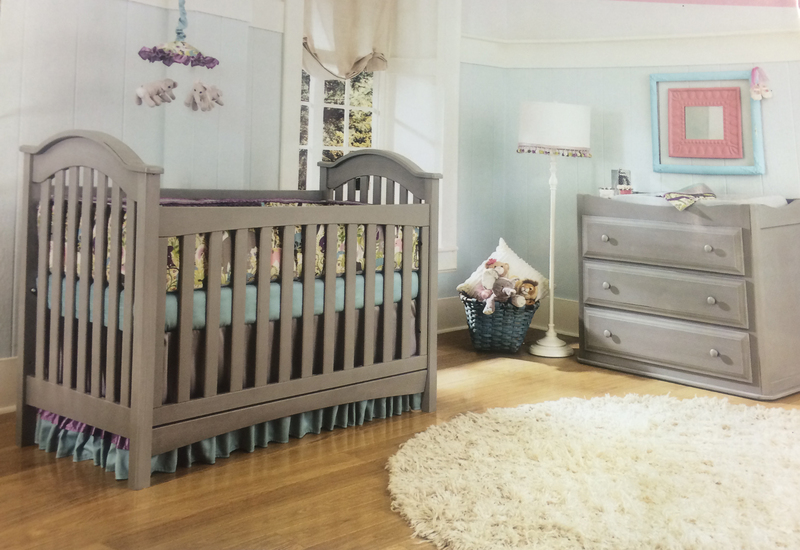 Is this your nursery or the display in the store? This was in the store! So, is the furniture going to get there before baby? 😉. That’s so great you decided to do some shopping early…since it wasn’t early at all! Probably not likely but fingers are crossed!